Washington said it intends to send two Guantanamo Bay detainees back home to Algeria. The Obama administration made the decision “in consultation with the Congress,” according to a White House spokesperson. The US Defense Department notified Congress on Friday that it plans to repatriate two Guantanamo detainees, White House spokesman Jay Carney said in a statement. He went on to assure that US President Obama “remains determined” to close the detention facility. It will be the first repatriation of Guantanamo detainees in three years, since two other Algerians returned to their home country in early 2010. Two Uyghurs were also freed and sent to El Salvador in 2012, although they were not repatriated, as China still considers the released Uyghurs to be terrorists. One of the former detainees – along with five other Chinese Muslims released from Gitmo in 2009 – has been stuck in Palau, his “temporary resettlement” spot, according to US officials. 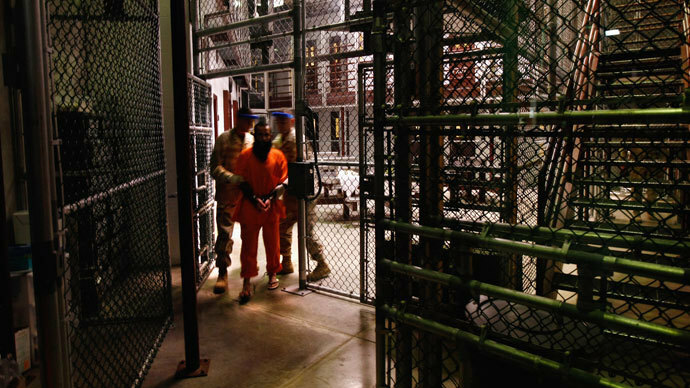 Eighty-six of the 166 Guantanamo detainees are still being held in the US prison, despite being cleared for release.